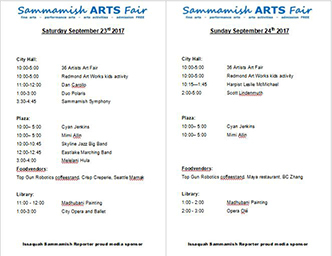 The Sammamish Arts Fair is an annual Arts Fair, which is now in its 11th year. It has grown in reputation to be one of the most anticipated arts events on the Eastside, and it will feature some of the best jury selected local artists in our area. 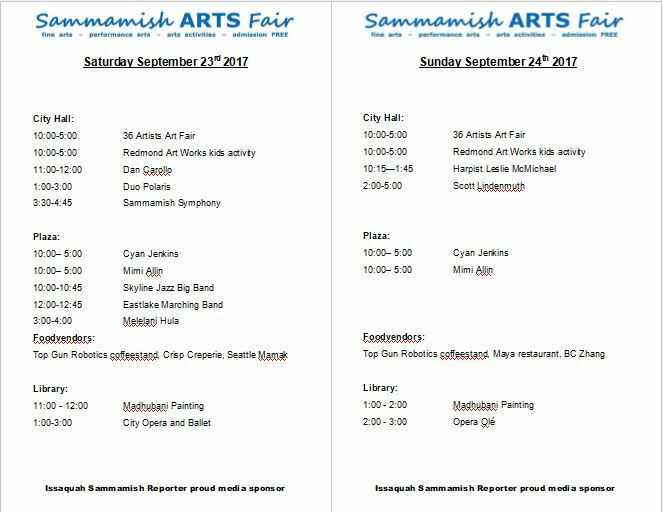 When Forbes recently ranked Sammamish as the number one friendliest town in America, they made mention of our annual arts fair. Come and visit with the artists, see their work and learn about their creative process. Inside the City Hall building, the highest quality and variety of fine art will be available for purchase, and will include original works of art such as; paintings, jewelry, mixed media, encaustic art, glass arts, ceramics, printmaking, woodcarving, photography and textile art. Along with the visual arts, will be musical arts, performance arts and children’s activities for the whole family. Look for things to see, hear and do in the city hall, the library and the plaza between the two buildings. Check out the program for more info. 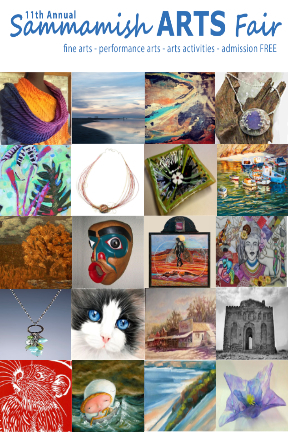 The Arts Fair is a community-wide cultural art experience, which is produced in partnership with the participating Artists and the Sammamish Arts Commission. The artists and community volunteers completely create and run the Arts Fair. Review several volunteer opportunities and sign up at our partner web site, Signup.com. 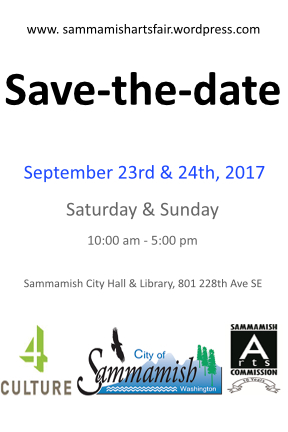 Sponsorship is grateful received from the City of Sammamish, the Sammamish Arts Commission and 4Culture. Admission is free. The Community: The Sammamish Arts Fair endeavors to create an easily accessible community arts and cultural event, that is produced to the highest quality, and showcases some of the best local artists residing in and around the Eastside, so that we may provide a rich fine arts experience for all ages and interests. The Artists: The Sammamish Arts Fair provides a unique platform for local artists to interact with the community and gain exposure and promotion of their artwork. We create a meaningful artists community, which is supportive of new and emerging artists as well as established ones, and encourage mentoring within the group both artistically and through team building whilst producing a successful arts event together. 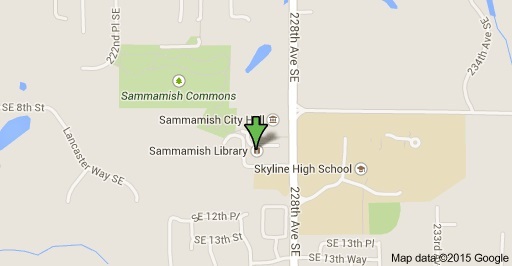 Sammamish City Hall, 801 228th Ave. SE, Sammamish, WA 98075. The big day is here! Enjoy the fair!